Please enter baby's name and dates if embroidery is desired. Please select desired color below for embroidery. 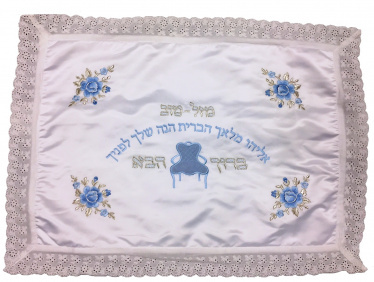 Beautiful embroidered pillowcase used at a Brit Milah (Bris). Written in Hebrew is Mazel Tov (Congratulations), Eliyahu Malech HaBrit Henay Shelach Lephanecha (Elijah, angel of the Covenant, here is yours before you) and Baruch HaBah (Blessed is the one arriving). Baby's name and dates can be embroidered on pillow. Use pull down menu above.